Distilled water is pure water. Distilled water is best for the transport of nutrients in the body and to the body’s cells and for the transport away of unwanted substances from the cells. 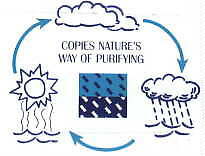 Apart for its use as drinking water distilled water has many other uses. The water distiller is a tabletop unit of the highest quality, with which you can distill your own water at home or at work. Clean water is necessary for good health. Your body contains over 70% water. Distilled water is the purest form of water. The water distiller produces pure water and eliminates all kinds of bacteria, viruses, organic and inorganic chemicals, heavy metals, radon gas, chlorine, poisons and other pollutants. Cold air cools the stainless cooling coil. 4 litre boiling vessel in stainless steel. Why should one drink distilled water? and takes waste material away from the cells. Water must be pure so as vital nutrients are absorbed and waste products are carried out of the kidneys and liver. Distilled water removes toxins and inorganic substances from the body. If the water one drinks already contains extra substances. 1.100% distilled water of the highest quality. 2. Easy to clean, portable, simple to use. 3. Boiling vessel in stainless steel, easy to keep clean. 4. Safe, switches itself off when distillation is completed. How does the water distiller work? collected in a plastic container. 1. Drinking water is poured in the boiling vessel and the start button is pressed. 2. The water is heated and begins to boil. One can pour boiling water in the apparatus for a quicker start. 3. Steam leaves the boiling vessel. Volatile substances such as chlorine leave in gaseous form through the gas valve. Minerals, salts and other solids remain in the boiling vessel. 4. The steam goes into the fan cooled cooler and condenses back to water. 5. Water drops slowly from the distillation unit. An active charcoal filter (supplied) can be fitted here, if required. 6. 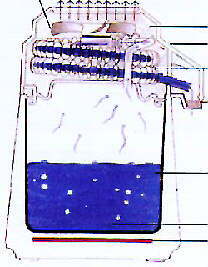 Water is collected in the glass clear plastics vessel of polycarbonate. When the vessel is filled – 4 litres - the unit automatically switches itself off. Extra polycarbonate containers can be supplied. The drinking water can preferably be kept in the refrigerator. 7. If the cover is closed and not reopened the shelf life of the water is over one year at room temperature. What does the water distillation unit cost? The water distillation unit costs SEK 1 995.00 including VAT and freight. The complete package includes the still, boiling vessel and various accessories. The water distillation unit is sold by: Dog Security AB, Malmo, Sweden.